GM’s Britta Gross, Director of Advanced Vehicle Commercialization Policy, gave perhaps my favorite presentation at the EV Transportation & Technology Summit. Her presentation was essentially split into two (or three) sections. She first talked about Drive Electric Florida, then Drive Electric Orlando, and then got into matters concerning GM’s electrification path and plans. This article covers some of the highlights from her talk about GM’s electrification path and plans (starting ~13:30 into the video below). The good news is, Britta and GM see the Chevy Bolt as being “mainstream ready.” GM is apparently ready to push this vehicle toward buyers, who are expected to love it. Talking about the Chevy Volt, Britta highlighted the statistic that 78% of Americans don’t commute more than 40 miles a day, demonstrating that the 1st-generation Volt’s electric range is sufficient for the majority of the public most days of the year. Going a step further, the 2nd-generation Volt has 53 miles of electric range. GM expects 90% of all 2nd-gen Volt miles will be electric, up from 80% in the 1st-gen Volt, and that 25% more gas will be displaced. GM is expecting 1,100 miles between gas tank fill-ups. Aside from the 2nd-gen Volt’s 40% improvement in range, it’s also quicker than the 1st-gen Volt. It’s 19% quicker to 30 mph (now getting there in 2.6 seconds) and it’s 7% quicker to 60 mph (now getting there in 8.4 seconds). Of course, there are a lot of little improvements to the Volt that enable all of this and that also make the new Volt better in other ways. 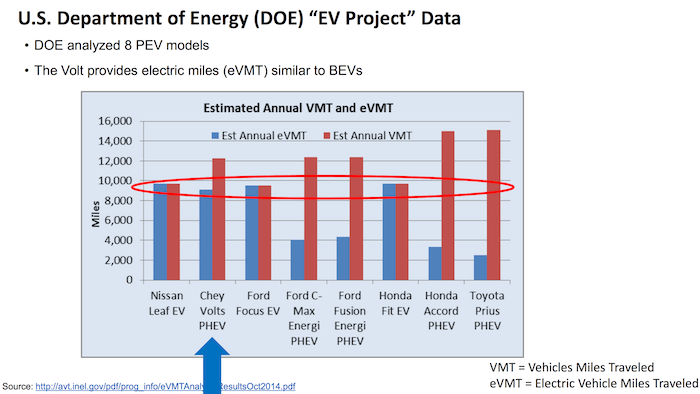 Research has already shown that 1st-gen Chevy Volt drivers drive approximately as many all-electric miles in a year as drivers of fully electric cars like the Nissan LEAF, Ford Focus Electric, and Honda Fit EV. Drivers of the 2016/2017 Volt shouldn’t have any problem matching that. Another interesting finding, which we’ve covered before on EV Obsession, is that GM found just 2 problems per million battery cells produced after 1 billion total miles driven. That’s pharmaceutical-level quality, as Britta noted. That was better than expected, and put to rest any lingering fears regarding LG Chem EV battery cell quality. Back to the Chevy Bolt, Britta emphasized that it would be available nationwide from the start. She also reiterated that it would cost $30,000 after the $7,500 US federal tax credit, and that it would have 200 miles of range. Britta’s closing point was a wonderful one. She pulled it out of a Plug In America report. The point is that, if every EV driver would convince one person to buy an EV each year, in 25 years, we’d have 100% adoption of EVs. The Q&A session kicked in after that, and there were some interesting questions and answers. For example, Britta explained why the 2016 Chevy Volt couldn’t be rolled out nationwide at launch.